clothes – lots of clothes, big clothes, small clothes, red clothes, blue clothes……. baby clothes – I single this out because it’s a big deal. All you mothers out there know that you don’t just let go of baby clothes if you think there’s a chance of having more children. Well, we’re stepping out in faith! Extra linens – Let’s face it, we aren’t a hotel and we don’t need 4 changes of sheets and 12 extra towels. All this to say, all these things are gone and the only real change we’ve experienced has been more room to breath and space to live in. When I imagine what life was like for our ancestors hundreds of years ago, I can almost see the bear walls, children with 1 or 2 dolls, and bear essentials in the house. There weren’t trinkets sold on every corner or toy stores at malls. The point? If the good life was available to them without the belongings we have these days, then maybe we can all do with a lot less. And more than that, when we have all this extra stuff, which we’re told is so necessary for a “good life”, we find it difficult to move, literally and figuratively. I have to admit that my wife is brilliant. She understood all this immediately, what it would take for us to be ready to move to Thailand. With our current plan to put our house on the market in March, she instantly began strategizing how to empty our house as well. She knew it would take a long time and she didn’t want to spend the entire last month in the house getting rid of all the small stuff. Of course, we a re going to bring some stuff with us. In the past few weeks, given our new self-imposed dietary restrictions, we’ve been using the food processor almost everyday, so that will definitely come. The kids will have their favorite books, games and toys (ie: legos/duplos). Shannon and I will have our special items (for me, that mainly means all my Marvel movies, for her, the complete works of Jane Austen that I bought for her our first Christmas together). 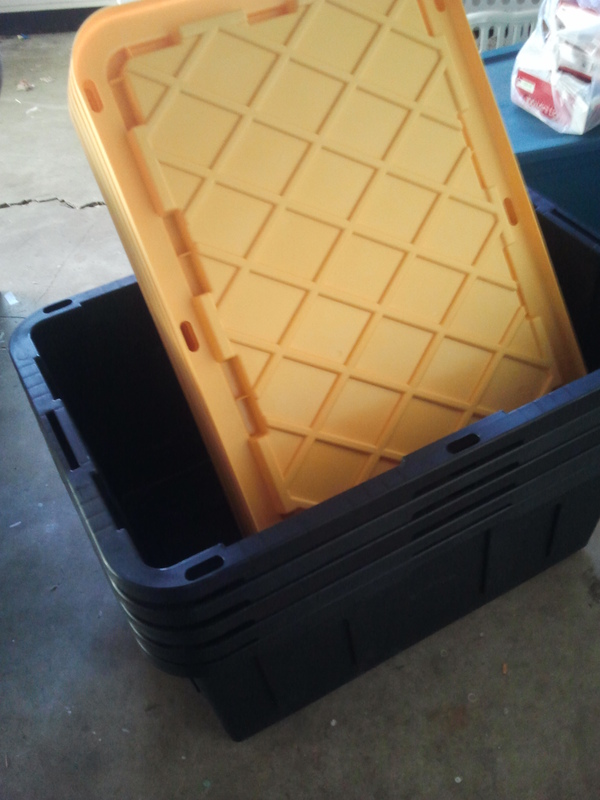 And thanks to Costco, I have some excellent storage totes to bring them in. By providence, I’m sure, I saw a guy at Costco with 2 of these in his basket. I didn’t want to be outdone, so I bought 5, at less than 2/3 the price of what they are at Home Depot. This was very exciting for me. Lately, we haven’t seen much fruit for our efforts. We’re asking ourselves everyday, what we do we need to do next? Sometimes the answer is reading, sometimes minimizing, sometimes resting. However, I was beginning to wonder if we’re going to be ready by June when we plan to leave. So, it was a relief this weekend to feel that we’re making some tangible progress, even if it is in the form of black and yellow boxes sitting in a slightly more empty garage. Thanks for the vote of confidence. As we go through this process, my eyes are opening to what people have had to press through in order to see their journey’s end (ie: the forefathers, the “cloud of witnesses”, Hudson Taylor and other missionaries). I just figured they packed a bag and left. I’ve started to think that when Jesus says, “the Son of Man has no place to lay his head,” that he didn’t mean it as a warning but instead as a command… I’m not making some theological statement in this, but I can see how it’s a lot easier to follow when you don’t so many things holding you back.